This map shows the areas that are at risk for debris flow. 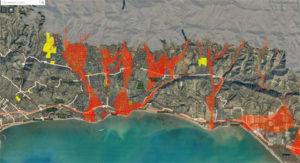 The areas in red will be included in an evacuation during a predicted debris flow causing storm. This page is updated as roadway conditions change. This is the most current information. SoCalGas is working alongside first responders in Montecito and Santa Barbara to assess the situation and to support public safety and our customers. 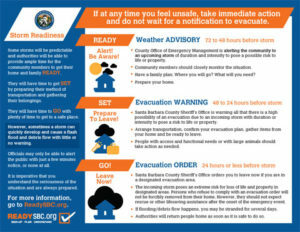 Our emergency operations center remains activated to coordinate response activities. The District is located in the southern coastal portion of Santa Barbara County and includes the unincorporated communities of Montecito and Summerland. Santa Barbara County has suffered impacts from several floods throughout the years. These flood events can cause serious damages to public property, infrastructure and private property. While the County and other agencies work hard to prepare for the winter, flooding can still happen. Residents and business owners should take some time while the sun is still out to evaluate the need for flood insurance, permanent drainage improvements on their property, and last-minute emergency actions such as sand bags and timber deflectors.